If you look around a couple of pages on this site, or around the web, you’ll often see mentions of unused things like weapons or classes. Why are they in the games? Obviously they were planned to be used but ended up left out for various reasons. Maybe the developers didn’t have time to fully implement them (some unused spells in Thracia 776 had unfinished animations) or perhaps they thought they disrupted the balance of the game (too many S Rank weapons in Path of Radiance?). Nonetheless, they remained in the game data. Why didn’t the coders just delete them? Game coding can be a rather tricky process. Keeping track of every single string of data is probably not a viable option. That’s before you consider whether deleting the data will cause adverse effects. If people aren’t ever to see the unused things (normal people anyway…), why not just leave them in? Usually, there’s no worry of the unused data hogging up space, especially with game sizes these days. So just what exactly is unused in all the Fire Emblem games? Well, I’ve tried to make a list of everything interesting that I’ve come across. Most people find these stuff just by using codes or hacking the game. Also, when compiling data for games, it’s not uncommon to bump into unused data. 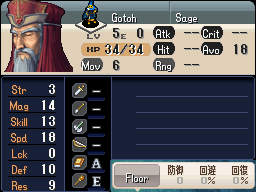 Gotoh—about the only playable character in Shadow Dragon who isn’t playable in this game—has unused data for his iconic appearance in Chapter 14; his stats are mostly inferior to his Shadow Dragon stats. During Prologue 7, Katarina asks My Unit if there’s somebody important in their life; usually My Unit responds that person is their liege, but there is an unused dialogue branch where they say that they don’t know if there’s such a person. Presumably this branch was removed because My Unit is going to become one of Marth’s knights tomorrow and it would seem odd if My Unit doesn’t want to serve their liege, Marth. At the end of Prologue 8, there is an unused scene where Norne says goodbye to My Unit, like most of their other allies. 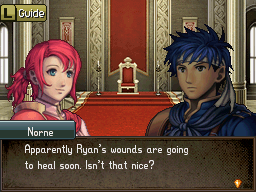 Judging from the dialogue, it seems Norne was going to be playable in the Prologue, possibly if Ryan reached 0 HP. There are three unused portraits, of Midia, Minerva and Shiida, in different (more casual-looking) clothes. Additionally, there is an unused portrait of Nehring, the boss of Chapter 19 of Mystery of the Emblem, which is slightly different to his portrait in New Mystery of the Emblem. Fire Dragon, Mage Dragon and Divine Dragon exist as separate classes, but without fully working map animations; their statistical data is actually used when fighting with the Fire/Mage/Divine Dragonstones. There is also data for male and female Cavaliers on foot, which probably meant dismounting (like in Mystery of the Emblem) was planned to feature at one stage. The My Unit feature, which allows players to create their own character, may have been planned to debut in Shadow Dragon. In the game, there is an unused heading for a “My Unit Registration” and “My Unit” is spelled in exactly the same way as the custom character in New Mystery of the Emblem and Awakening. Avoid: Order units to stay out of enemy range unless otherwise instructed. 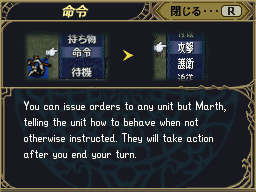 Protect: Order units to protect Marth unless otherwise instructed. Attack: Order units to attack nearby enemies unless otherwise instructed. Wait: Order units to stay put unless otherwise instructed. Follow: Order units to stay with Marth unless otherwise instructed. 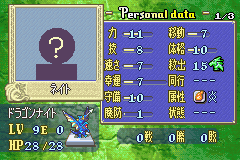 Like in Path of Radiance, Zelgius has unused data, despite not appearing as an unit on the map. Curiously, he’s programmed to fight with an Iron Sword in his battle with Skrimir in Part 3 Chapter 4.
Notable items include Slim Lance, Warp Powder, Wild Stone (probably functions as a Wildheart version of the Laguz Stone or Gem), Serenity, Tempest, scroll versions of the Beorcguard, Laguzguard, Knight Ward, Full Guard and Knight Ring items from Path of Radiance, as well as two Dark variants of the final boss’s special attacks. Basic dark tomes could also be forged. Tabasa, Nabe and Lalomi appear amongst a bunch of NPC characters, while Gritz and Jacob appear with the relationship diagram characters. In Part 4 Final-1, there is dialogue suggesting that Hetzel could be spared in that chapter. Additionally, there is an unfinished synopsis of the story, which has a few details that are slightly different, such as Marado being named Rino and Ludveck being named Charolai. Digging a little further, it seems the Dawn Brigade was originally going to be named the “Dawn Feather”. It seems the developers were originally going to include full length support conversations (like the ones in the previous three games) instead of the watered down ones that you see now. One major difference is that only data for A-rank supports exists, so it’s possible the developers intended to utilise the current “everybody supports” system, but have special conversations for certain pairs when they reach the A-level support (that’s just my guess though). The list of support pairs can be found here. Some of these characters appear in dialogue, but never on the battlefield. The full list can be found here. Zelgius’s data might just be proof of the Black Knight’s true identity. Melty is used as the Pegasus Knights summoned by Tanith’s Reinforce skill, while Heather doesn’t seem to ever make a physical appearance. Leanne and Nealuchi both have escape and death quotes, as well as support data, perhaps indicating they were going to be playable characters or at least characters on the field. Additionally, there are map models for Deghinsea, Sothe as an Assassin and an older Sanaki (some images here). 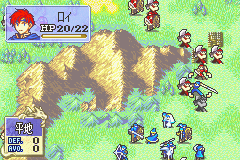 Unlike regular Sanaki, older Sanaki has a magic casting animation on the map. These include some generic Thieves, Renning and a hooded Soren. The Renning portrait is often used as evidence that Bertram, of the Four Riders, is in fact Renning. These include most of the female mounted knights, female Bishops, Black Dragons and non-royal Herons. The female Bishop is actually used as a dummy class, most notably for Elincia (although Sanaki, Kurthnaga and Gareth use it as well). The Black Dragon class is used for Kurthnaga during an event. This game has got tons of these, most notably three extra S Rank weapons—Urvan, Rexcalibur and Rexflame. All three work fine, although the latter two don’t seem to have proper map animations. Rexcalibur is apparently shown in a game demo, leaving a few people wondering how to get their hands on it. 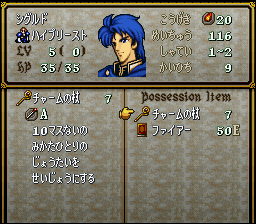 Additionally, there are three staves, several Skill books, the Devil Axe and the Bright Bow. 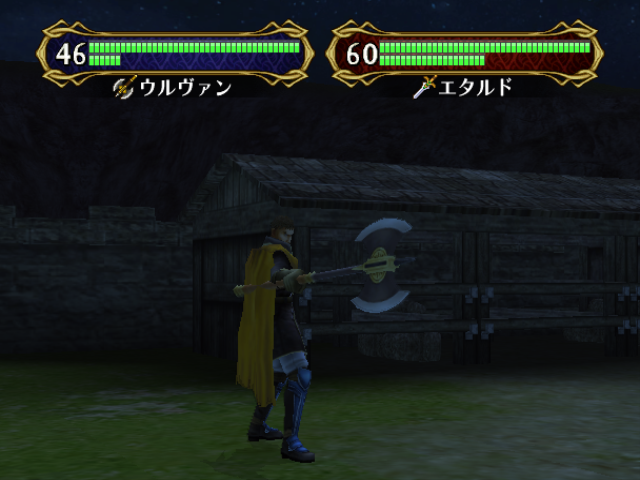 The Bright Bow is the the magic-based weapon for bows and can also target enemies adjacent to the user, so it could have been a strategically useful weapon. The Vigilance scroll can be used on Ulki as expected, but can also be used on Sephiran in the Japanese version. Amusingly, the Canto scroll can only be used on transformed herons, but herons cannot transform in the base… There are also unused Rapier and Lightning Sword models and hints of a Silver Card and Member Card. The Iron Wall skill is the most complete unused skill, possessing its own skill icon and scroll, but its effect is still unclear. 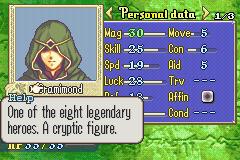 More mysterious skills include Bargain (same name as in Genealogy of the Holy War and Thracia 776), Chants (galldr?) for every stat (perhaps similar to the Dancer/Bard rings in Blazing Sword? ), Chaos, Charisma (another returning skill, translated as Charm in the English version, and I think this skill is actually attributed to every boss in this game), Confront (Charge?) and Evil Eye (Glare from Radiant Dawn). Additionally, it seems Wyvern Lords, Falcon Knights, Sages and Bishops were each going to get their own Mastery skill, instead of sharing Stun and Flare. Finally, Wrath and Great Shield were planned as Mastery skills—the Wrath Mastery later became Colossus, while Great Shield presumably became the Hawk’s Cancel. 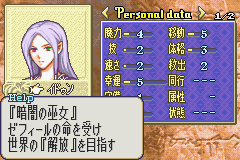 These names have no physical data (other than their name) and include Hauteclaire, Fire Emblem (both appear towards the end of the swords list), Yune, Monica (appears between Calill and Largo), Glice (probably a boss), Astarte (known as Ashera in the English version, appears after Reyson and Leanne and before some generic soldiers) and Astartyune (seems to imply some relation between Ashera and Yune? It appears after all the Light magic). 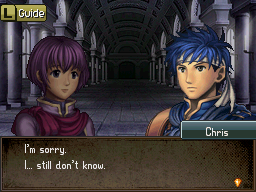 No conversations exist for these supports, although Zihark has an unused alternate dialogue in the Epilogue, which seems to be a remnant of his support with Ike. Just two—an alternate Game Over theme (which was recycled in Radiant Dawn) and a Comical theme. Meanwhile, the sound data suggests there were plans to give Bertram, Ena and Petrine each their own battle theme. Maybe Ena was originally going to be the last of the Four Riders, in place of Bryce? Similarly, Sephiran and Ashera were each going to have their own theme (although Ashera’s theme may not have been used for herself, but when explaining her history, although that’s just my guess). Interestingly, there were apparently plans to implement an arena of some kind and possibly a class roll. 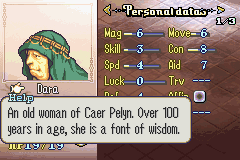 Dara, Saleh’s grandmother, has stats as a (male…) Druid and a rather nifty profile description. Other unused items include a dummied Mani Katti, Forblaze, Luce, Earth Seal, Mine and all of Ninian’s dancer Rings from Blazing Sword. The Earth Seal works normally (probably has the same effect as the Master Seal), as do the dancer Rings and the Mine. Forblaze and Luce don’t have spell animations, while the Mani Katti cannot be used by anybody (normally). All of the dummied weapons have the name “Dummy” in the English version. Bizarrely, the Nightmare “staff” used by the Demon King has an unused stat bonus of +5 Defence and +5 Resistance. This stat bonus cannot be seen normally because staves can’t be equipped, so maybe Nightmare was originally going to be an item type that could be equipped? Nate’s stats in the prototype version. Quite the looker, huh? Nate was a Wyvern Rider whose role was replaced by Cormag (who originally had Joshua’s role as a coin-flipping Mercenary). Demi appears amongst generic boss names. Mehve, Loewe and Mulitia are unused names in the prototype version, appearing at the very end of the character names list. For futher details, please check here. Bramimond has the class “Bramimond”, incredible stats (and growth rates) and S Ranks in Dark and Staves; amusingly, he is equipped with both Forblaze and Aureola, but can’t use either. Leila is a Thief, but with an Assassin map sprite and a S Rank in swords. Uther is a General, with great stats as well. Eleanora is a Bishop that can use Anima magic in addition to Light and Staves. 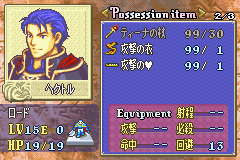 Elbert is a Peer and can use both swords and lances. Elbert and Eleanora have generic growth rates, whilst the former three do not. Perhaps it was planned that you could use them? The “Lycian Knight” appears to be the predecessor of Eliwood’s Lord class; it is a mounted class that wields both swords and lances (with a higher proficiency in lances) and promotes into a Paladin. The “Lycian Swordfighter” is almost identical to Lyn’s Lord class, but promotes to Swordmaster instead. 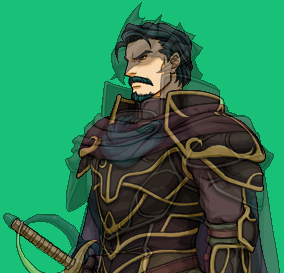 Hector’s “Lycian Armorknight” class promotes to General and can wield both swords and axes. All three classes share the map and battle animations of the Lord classes and, in the English version, they have the same names as the corresponding promoted Lord classes (eg. Lycian Knight is named Knight Lord). Additionally, there is an unused female Peer class (whose map sprite is used by Ismaire in The Sacred Stones), possibly belonging to Eleanora or Hellene, and a Princess class (incorrectly referred to as Queen in the English version), which, judging by its size, would have belonged to Guinevere. These only have names and, include: Tiina staff (same as in Binding Blade), Battle robe and Battle call. According to leaked data from Intelligent Systems, the Battle robe item was changed to a Defence robe, which eventually became the Ninis’s Grace item held by Ninian in the final release. Digging into the prototype version, the Battle robe is shaped like the Dancer’s robes, while the Battle call (with a placeholder heart symbol in its name) is shaped like a Bard’s flute. 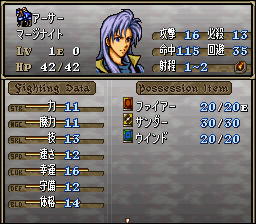 Quite a lot of unused names in this game: Igrene (likely the same character as in Binding Blade, also an Archer in the prototype version), Nadine (no, not Natalie, Dorcas’s wife), Bruno, Bogan, Efta, Igor, Alexis, Baudouin (probably all bosses, Efta sounds like a Morph’s name). William appears to be an unused boss, with a similar portrait to Roberts (a mini-boss who appears in Chapter 11A, in Hard Mode). Idoun has some basic Shaman stats for her various appearances; her description reads “The Priestess of Darkness ordered by Zephiel to liberate the world”. The Divine Dragon class is basically Fa’s transformed state. However it has a glitchy map sprite and no battle animations. There are also female Mercenaries, Social Knights and Paladins programmed. 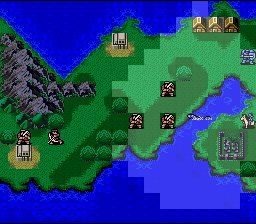 The “female” Mercenary has an alternative map sprite (which looks a bit like a Myrmidon), but no battle animations. The latter two have very glitchy map sprites and, again, no battle animations. Binding Blade features the infamous Watch staff. It’s supposed to reveal rooms hidden by roofs (like the ones in Chapter 6), but it doesn’t do anything in this game. 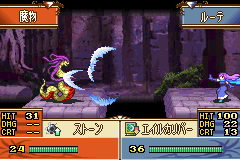 The Demon Dragonstone functions identically to Idoun’s Dark Breath, but bestows stat bonuses so maybe it was intended for a Mamkute version of Idoun. The Demon Dragonstone is actually listed under some of the official guidebooks, but is definitely unused. The Bridge Key doesn’t seem to do anything since there are no drawbridges. Finally, the Blizzard tome was going to be another long-ranged Anima tome, but was replaced by Fenrir. I apologise for the bright yellow background, blame IS for picking a nasty transparent colour! There were a few world map locations that ended up not being used: Phestos, Siene, Alesia, Terina, Calach and Regia. For further details, please check here. Manfroy and Yurius have data for this game, despite making very brief appearances in the dialogue. They both have the wrong portraits though—Manfroy has Machua’s, while Yurius has Yuria’s (another version of Yurius has Cyas’s portrait…). Also there is an unused Bishop character, Gunna, who is stored amongst the playable characters’ data. He has the same portrait as Coen (Ida’s father). Gunna is speculated to be Asvel’s father or grandfather, due to his class and death quote. There are portraits for Arthur, Janne, Asaello and Daisy from Genealogy of Holy War in the same style as the other portraits in this game. Another unused portrait—what looks like a Pegasus Knight, and who some believe is Femina—can be found, although there is no pointer to it. Several classes from Genealogy of the Holy War appear, most notably: Lord Knight, Master Knight, Falcon Knight, Dragon Master, Junior Lord, Emperor, Dark Prince and Forrest. There are also unused map icons for the Princess, Queen and female Loputo Mage classes. Almost too many to name. Most of these are from Genealogy of the Holy War as well: Gaeborg, Gungnir, Falaflame, Thorhammer, Aura, Loputousu, Bolganone, Darkness Spear, Master Proof and… the Watch Staff. Just highlighting some of the spells freezes the game because their descriptions are incorrect. Otherwise they all work, albeit with very glitchy animations. The Gaeborg and Gungnir are interesting in that they possess the holy weapon flash from the previous game (that and the Gungnir’s weapon description even tells you that hacking is bad and not to do it!). The Master Proof finally made a proper appearance in The Sacred Stones (known as a Master Seal in the English version). The Watch Staff causes the screen to glow when used (like when you conquer the throne in the Final Chapter), but doesn’t seem to do anything else. Several unused conversations feature. In Chapter 19 there are conversations that suggest Ishtar was supposed to make an appearance in battle (backed up by the fact that she and her Torhammer spell has data). In the Final Chapter it seems there was going to be another (final?) boss—perhaps a monster since its lines are in Katakana (like Mediuth and Loputousu). Also there is some kind of timeline, similar in style to the one seen in Genealogy of the Holy War, which also states the full names of major characters Celice and Leaf—Celice Baldos Chalphy and Leaf Faris Claus respectively. Lots of soldiers, or more precisely: Soldier, Sword Soldier, Spear Soldier, Axe Soldier and Archer. They are all Soldiers with different weapons (like the Armours in this game). The Spear Soldier seems to be a stronger lance-using Soldier. Perhaps they were axed in favour of the Sword/Axe/Lance/Bow Armours? The Charm staff seems to be a status affecting staff like Sleep, Silence and Berserk. It doesn’t do anything (it freezes the game when used), but maybe the name has a clue… The Thief staff only works with map animations (it freezes the game otherwise) and steals gold from enemies, which might have come in handy. 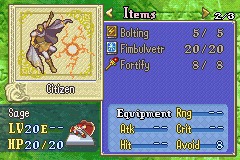 The Thief staff reappears in Thracia 776, where it is one of Tina’s personal staves. A couple of skills never appear as personal or class skills, although they have icons. These include: Return (same effect as the Return Ring), Recover (same effect as the Recover Ring), Re-Move (same effect as the Knight Ring), Holy Sword and Darkness Sword. More details on them can be found in the Skills list for Genealogy of the Holy War. The characters from the original who didn’t return, like Riff and Daros, have data but no portraits. The Guardian looks very similar to a General, but I don’t believe it is programmed to use any weapons. The Dark Knight is basically like a Social Knight or Paladin (it has a Social Knight battle sprite). Perhaps it was meant to be a custom class for Camus. Finally we have the Sea Dragon, which has the ability to move freely on water just like Pirates; it uses a Fire Dragon battle sprite, which is disappointing. All three classes have a glitchy inactive map sprite (since chapters are restricted to a finite number of class sprites). Includes Silver Key, Dark Dragonstone and Ohm Fragment. The Ohm Fragment was supposed to resurrect its user after death, before vanishing, but doesn’t actually do anything. Not completely related to the game and not quite unused content, but I couldn’t think of a better place to put this. 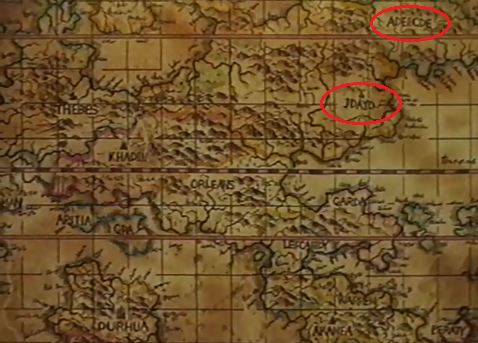 The world map of Akaneia that briefly appears in the Fire Emblem OAV reveals the names of two territories to the far north east, which aren’t named anywhere else. Although, I don’t think anybody would consider these names canon, because what kind of names are Jdayd and Adeecde…? There is an unused battle conversation that suggests Midia was originally an enemy character in Book 2. Judging from the dialogue, maybe she was convinced by Hardin’s lies just like the Wolf Knights? There are at least two unused classes: Serpent and Naga. Naga is also the same name as the Divine Dragon King from Akaneian lore, but these are probably just monster classes (Naga are serpent deities in Hindu mythology). Judging by its name, the Gaia spell was likely an Earth-based spell. It doesn’t have a proper spell animation though. 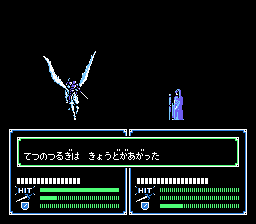 Sabre (slightly different name to Savor from Gaiden) is an unused playable character, with Misheil’s portrait, who also has data as an enemy. Wylar is one of the first non-playable characters and doesn’t have a portrait. Basilisk, Salamander and Narga appear towards the end of the character list, along with Gaia; the first three are names of the dragon tribes, so maybe Gaia was going to be the Earth Dragon tribe’s name? 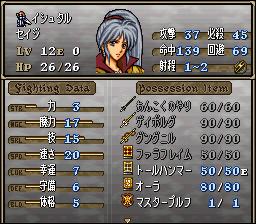 Before it was finally implemented in Thracia 776, it seems Fog of War was initially planned for this game, judging from the Telescope item, which claims to increase Vision by 5 when used. The Dark and Time Orbs (no Life Orb?) can be used 3 times each, but nothing seems to happen when you use them. Finally, we have the Fire Emblem in item form; unlike in Mystery of the Emblem, anyone can hold it—Shh, don’t tell anyone!